Joan has a porcelain crown placed over an implant. 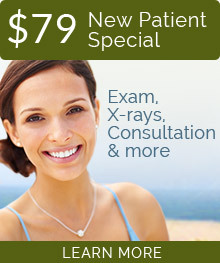 The look and feel is so natural, she has trouble distinguishing it from her other teeth. 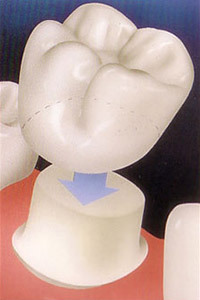 An inlay is a porcelain restoration that fits between the cusps. An onlay is a porcelain restoration that fits over the cusps of the tooth; an inlay fits between the cusps. They are more durable than a filling for large cavities, and a much more conservative option than a crown for situations where there is a large portion of the tooth structure that is missing. When placing an isolated crown among natural teeth, our doctors want to make sure that the teeth are perfectly matched. 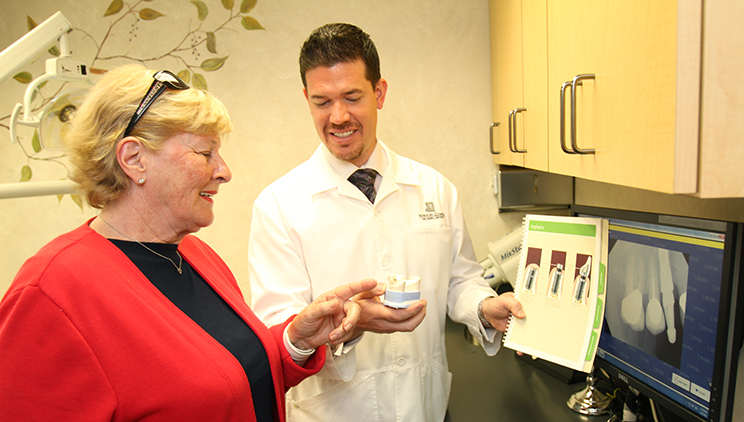 Crowns are a main staple of dentistry, and our doctors have placed their fair share of them. What makes our crowns different is our doctors’ eye for a natural, aesthetic look, the quality of materials we use and our excellent dental labs. Our doctors make sure that there is no gray line between the base of the crown and the gum. They use porcelain material for the front, visible teeth that has the translucent look of natural teeth. 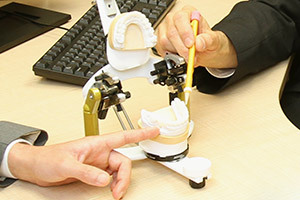 When placing an isolated crown among natural teeth, our doctors want to make sure that the teeth are perfectly matched. They take hundreds of photos and use computerized shade matching to ensure this perfect match. Using the photographs and shade and fitting instructions, our dental lab ensures the crown is made to look exactly like your surrounding natural teeth, with the same shape, shadings and translucencies. Patients getting multiple crowns can choose the shape and shade they want, often to create a whole new aesthetic look for them. Crowns can affect the gums long-term, so our doctors make sure that the crowns are not placed under the gum line, which prevents inflammation and keeps the gums healthy. Our doctors take time when making the crown to ensure it is just right. Our doctors take their time over making the crown to ensure it is just right. Even the temporary crown, worn while the final crown is being created, is an important part of the process. The doctors work to get the temporaries as close to the final as possible. They ask the patient to study the function and look of the crown or crowns and bring back notes on things that can be corrected. This data is relayed to the lab, ensuring a truly well-fitting and well-matching final crown. Our doctors minimize the amount of drilling needed and use fast electric hand pieces for efficiency. We use a variety of material for our crowns, depending on the circumstance. Patients can choose to have porcelain-fused-to-metal crowns, often gold is the most durable option, but many patients opt for our no-metal crowns using either porcelain fused to zirconium (a very hard ceramic), pure zirconium or e.max porcelain, a top-of-the line porcelain. Pure zirconium and e.max porcelain are especially good for the back grinding teeth as they can withstand the high pressure. All-porcelain crowns have a more aesthetic, natural look. Porcelain fused to metal crowns are actually more brittle than a strong all-porcelain crown, such as e.max, which can withstand more than twice the pressure. Inlays are more durable than fillings for large cavities. An onlay is a porcelain restoration that fits over the cusps of the tooth; an inlay fits between the cusps. Onlays and inlays are more durable than a filling for large cavities, and a much more conservative option than a crown for situations where there is a large portion of the tooth structure missing. An onlay or inlay retains more of the natural tooth structure than a crown and can actually bring back a tooth to its natural strength without destroying any more of the tooth structure. Onlays and inlays can also give a more natural look than fillings, especially for the premolars, the chewing teeth between the molars and the canine teeth. Onlays and inlays are useful restorations that are generally underused in the dental world. Their ability to preserve tooth structure and their durability as an alternative to fillings gives them an important place in our dentists’ toolboxes. The making of dental restorations (crowns, inlays, onlays, veneers and dentures) is a partnership between the dentist and the dental lab. We use quality dental labs that limit the amount of dentists they work with to ensure they can dedicate enough time to each restoration, and who have highly trained and experienced technicians.